Yamato and Musashi comprised the Yamato class. Shinano was initially assigned to be the third ship of the class. However, the Shinano was converted to a carrier, during the building period. The Yamato class was designed during the years 1934-1937. The ships were built for world conquest, according some reports of Japanese staff, who were responsible for their design and construction. There were very few, if any, restrictions placed on the Japanese naval constructors. They were given the simple directive to produce the most powerful in the world. The design was conceived more than 11 years ago, when the largest Japanese warship was the Nagato. some 73,000 tones and mounted a 46cm (18.1 inch) main battery. The Yamato and Musashi were probably the largest and strongest battleships constructed in the world. They were built for the Imperial Japanese Navy (IJN) and constructed and operated during World War II. They were displacing 72,000 long tons (73,000 t) at full load. 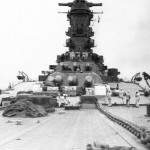 The class carried the largest naval artillery ever fitted to a warship, nine 460-millimetre (18.1 in) naval guns, each capable of firing 1,360 kg (3,000 lb) shells over 42 km (26 mi). Two battleships of the class were completed, but a third (Shinano) was projected and part of the work was done when it was decided to be converted to an aircraft carrier to address the looses of carriers after the Battle of Midway, June 1942. Yamato and Musashi spent most time in naval bases at Brunei, Truk, and Kure—deploying on several occasions in response to American raids on Japanese bases—before participating in the Battle of Leyte Gulf in October 1944, as part of Admiral Kurita’s Centre Force. The problem was that American submarines posed in danger the units quite often. IJN never spent too much efforts to address the American submarine warfare with anti-submarine units. Musashi was sunk during the battle of Leyte Gulf by American carrier airplanes. 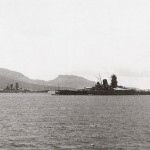 Shinano, which was the largest aircraft carrier of the IJN and US Navy, was sunk ten days after her commissioning in November 1944 by the submarine USS Archerfish. Lastly, the Yamato was sunk in April 1945 during Operation Ten-Go, an almost kamikaze mission to protect Okinawa from an American invasion. It was planned that Yamato should become a coastal fortress in Okinawa. But its task force was discovered in half route from kyushuu to okinawa and never arrived to destination. 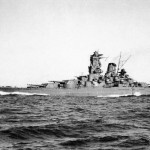 Yamato was sunk on 7 April, 1945 by U.S. naval aircraft. 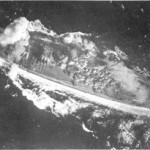 The Yamato was struck by at least four bombs and at least nine torpedoes. It was reported that additional three torpedo hits occurred, but few notably details concerning these could be obtained from survivors. 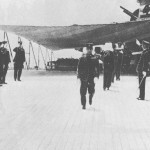 The majority of the torpedoes struck on the port side. 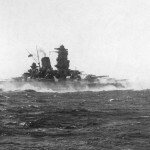 The reports indicated that some 20 to 30 minutes after the last attack, Yamato capsized. The weapons magazines exploded as Yamato rolled under. 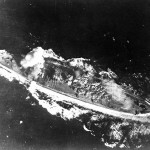 Yamato at combat during air attack in 1945. Yamato hit by a bomb in 1945. Yamato under construction at Kure. 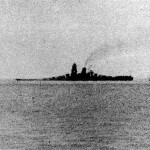 The last image of Yamato in 1945 at combat. 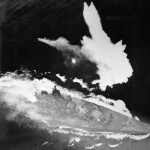 The last battle of the Musashi battleship was a very epic encountered between the Musashi battlegroup and a series of air attacks done by the U.S. Naval planes. 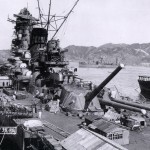 The details of the last battle of the Battleship Musashi can be found in this page:The last battle of the Musashi Battleship. Musashi was sunk on 24 October 1944 by U.S. naval aircraft. There was quite confusion about the number of bombs and torpedoes that hit the Musashi. First, it was thought that 16 bombs struck her. However, it was argued that these had no important effects as sinking was concerned. From the Japanese side, it was reported that at least 21 torpedoes struck the Musashi. However, further confirmation from different sources, includingthose from interrogation of survidors and other Japanese personnel, suggested that only ten torpedoes (possible four additional ones) hits could be located and identified. These torpedo hits were assumed to be located equally divided on both sides and were the main cause of sinking the Musashi. The sinking occured some four hours after the last and most vicious attack. Musashi went down by the bow, capsizing whehn the forward flying deck was submerged. Comparison of damage control performance. had in counterflooding of outboard voids to control list was proven to have been misplaced. 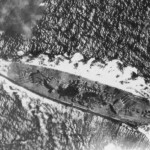 Counterflooding measures, although reasonable well executed, were inadecuate aboard Yamato and Shinano. Serious design erros were made in locating Taiho’s forward gasoline tanks beyond the torpedo defense system and immediately below the floor of the forward elevator pit – itself below the waterline when the ship was fully loaded. The lingering death throes of Musashi, in which four hours were required for her to sink after the last attack, is an impressive demonstration that torpedo hits equally distributed on both sides of a capital ship are not as lethal as in the case where they are concentrated only on one side. Musashi and Yamato in Truk Lagoon in early 1943. U.S. Navy Task Force 38 aircraft attack the Imperial Japanese Navy battleship Musashi (foreground) and a destroyer in the Sibuyan Sea, 24 October 1944. 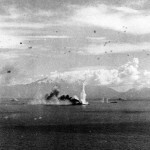 Musashi under aerial attack, 24 october, 1944 during battle of Sibuyan sea. The ashes of Imperial Japanese Navy Admiral Isoroku Yamamoto are carried from the battleship Musashi at Kisarazu, Japan on May 23, 1943. 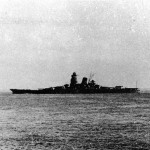 The recent announced finding on 5 March 2015 that Musashi’s wrecks were found has sparks new interest in battleship Musashi .